Erchonia's lasers made history by becoming the first to receive FDA market clearance for the treatment of chronic pain, proven through two double blind IRB studies. The Erchonia Lasers are the most advanced lasers on the market, with their sleek revolutionary design, patented line generated beam, and the ability to program independent frequencies in all of their family of lasers. How does it work? Photonic stimuli excite the body's cells infusing them with energy, with the three primary reactions being, reduction of inflammation, cell regeneration and increased blood flow. Does it hurt? No, most people do not feel anything, for those that have reported a feeling, it is nothing more than a slight tingling. Pelvic Stabilizers provide the comfort, support, and protection needed to balance your body. The inserts are placed in your shoes to help improve your body's balance, posture, and alignment. They are the only orthotics designed to support ALL three arches of the foot. By providing proper support for your feet, Stabilizers help create a balanced foundation for your body. Decreasing stress on your feet, ankles, knees, & spine. 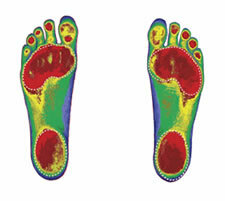 Our doctors can scan your feet and within seconds you will see your unique foot print. Just like no two people have the same finger print, no two people have the same foot scan. Therefore, generic inserts found in local retail stores may not provide you with the corrective treatment you need. Many insurances will pay in part or in full...ask today! Foot Levelers Kinetic Chain Animation from Foot Levelers on Vimeo. Restoring strength, endurance, and bulk to detrained muscle groups is important to "hold the adjustment". This is the fundamental basis of returning a patient back to prior functional capacity. Increased blood flow to injured tissues to quicken the onset of the healing process. Preventing formation of fibrinous adhesions with active muscle contraction and joint motion, and reduce them after their formation is an early goal. Neuromuscular retraining, defined as moving a muscle against resistance to retrain neural pathways that have been previously inhibited by pain or immobilization of a motor unit will be performed in the office and prescribed for home. This prevents the entrenching of improper or nonoptimum neuromuscular patterns of movement that may later cause pain after a sudden uncoordinated movement. An example might be abnormal tightness in intrinsic muscles that can produce abnormal spinal motion. Restore aerobic capacity to preinjury levels if the patient's job or normal activities demand it. There are also some studies that show aerobic exercise alone has a significant effect of reducing low back pain. We restore the patient's confidence that they can perform normal tasks and use the injured region in a normal manner. This can minimize "functional overlay" and get the patient back to normal activities quicker. Exercise prescription can also be used to determine if functional overlay is present because the physician is directly observing the patient performing a number of revised or nonresisted movements, and can use this information for comparison of orthopedic testing and other objective findings. Our doctors are directly involved in the physical rehab performed. A disadvantage of physical therapy sometimes is that the ordering doctor is not directly involved in the patient's care. We educate our patients about diet and supplements. It's easy to get on board with the lastest fad diet sweeping the country or order the newest Magic formula. We believe in a common sense approach. Portion control, whole foods instead of processed foods, and pure water combined with an active lifestyle will cure most of today's lifestyle diseases. We can evaluate blood, then determine a specific diet and exercise regimine unique to each patient.